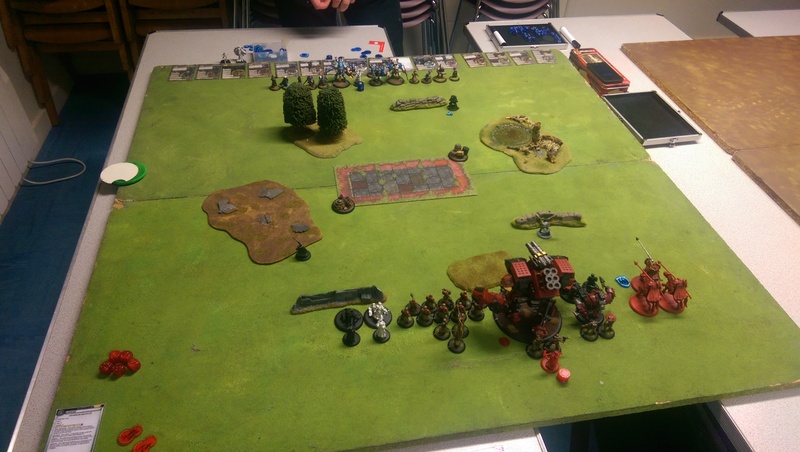 I won the roll off and chose sides, opting to go second due to the combination of free Desperate Pace, 10″ deployment zone, and the Mortars being able to advance and shoot on turn 1. We advanced towards each other. Going second I starting trying to scatter AOE’s over Rich’s force (unsuccessfully). One Mortar advanced under Desparate Pace and was about 1/2″ out of the objective effect, the second ran into range. Due to the Killbox, the position of the wall where I wanted Sorscha to be and forgetting activation order, I did not get Iron Flesh onto the WG unit. Turn 2: (No picture for this turn – realised after renaming and uploading pics that they didn’t match up and I was missing a turn). Lots died! Not having Iron Flesh hurt the Winter Guard, and they were picked off relatively easily, despite bobbing and weaving. The Mortars were also lost, though the Manhunter survived by virtue of being just out of charge range. In my turn, the Manhunter took out Finn (I think? 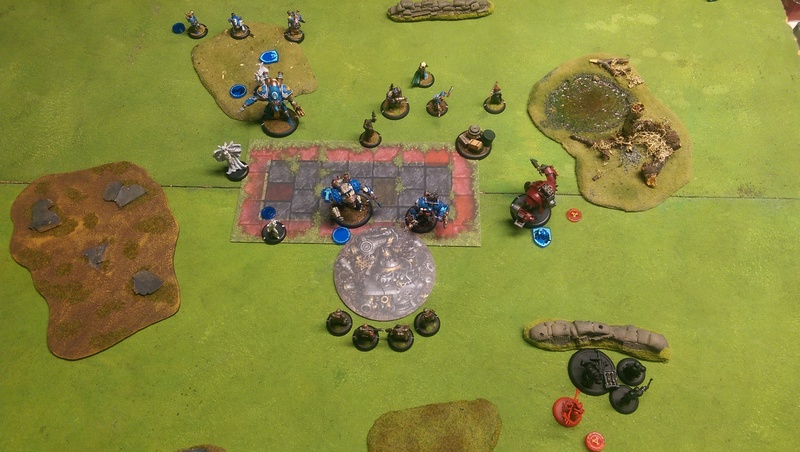 ), Sorscha put IF on the WG, and I tried for a Conquest shot on Dynamo, hoping for the Crit to throw him into Haley. I was out of range by a fraction, and subsequently the crit effect wouldn’t have worked as intended anyway due to Shield Guard on Gallant. 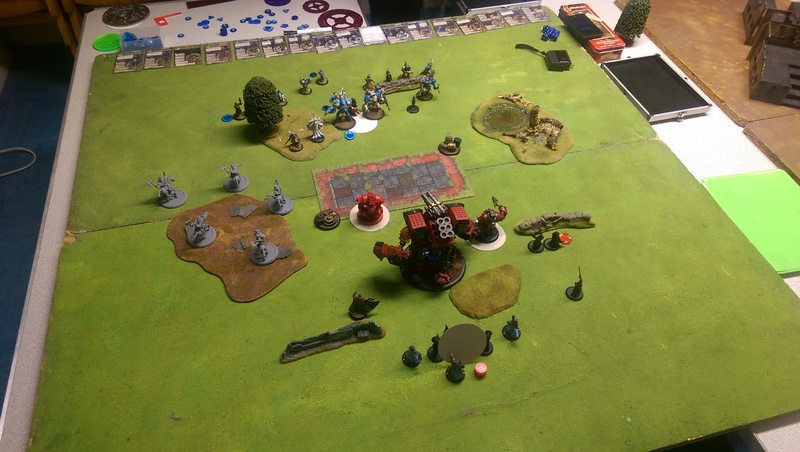 Marksman takes care of Anastasia, WG CRA’s fail to hurt Harlan Versh, but kill off Pendrake. A concerted effort from Rich killed off Conquest, and he scored another Scenario point for controlling the zone after pushing out the Destroyer again. My final last ditch attempt had the Destroyer going for a hail mary shot on Haley and missing once more. 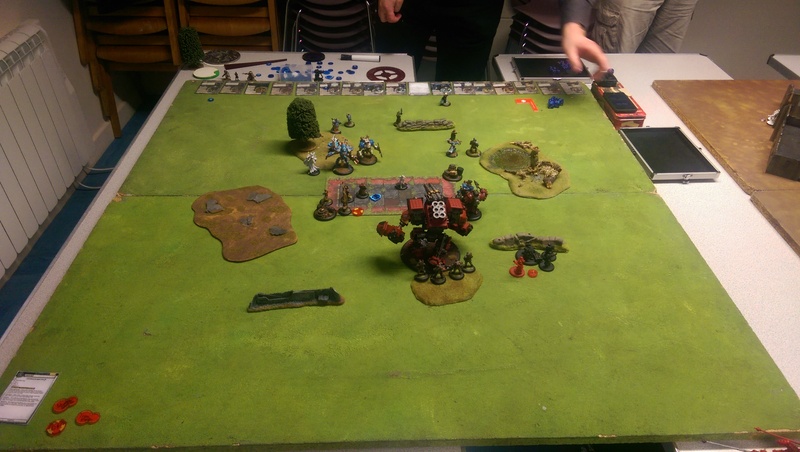 At this point I conceded due to a severe lack of table presence and ability to prevent a scenario win. I knew from the beginning that this would be a tough match up due to the lack of magical attacks / weapons for dealing with the Haleys. That said, I wasn’t displeased with the handling of this list (first time I had used it, and second time ever with Sorscha 2). 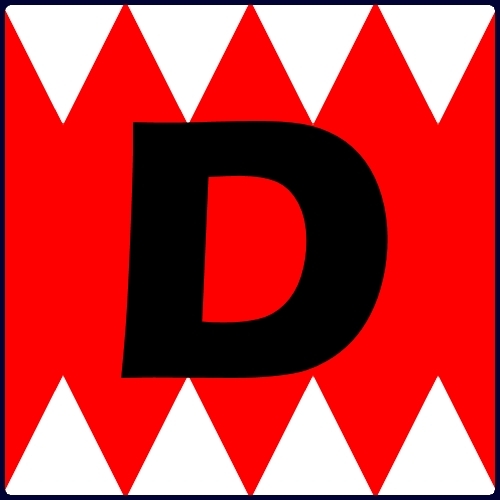 Things to remember – Think more during deployment about what needs to happen turn 1, and where the models/units need to go. Not having Iron Flesh on the WG was not ideal. Also, remembering to feat (if available) for the last desparate assassination attempt. Given that the game was over if it didn’t work, not feating was just silly. Having time for a second game, and knowing that Rich would be playing Haley 3 for a while, I switched to Zerkova 2 as it feels a better match up, and adjusted my SmogCon list for her up to 50pts quickly by adding Conquest and dropping the Mortar. Rich won the roll off this time (though I forgot that my Theme Force gave me a +1 to starting roll), and chose to go first. Out of laziness and to save time, I chose to stay on the same side as the previous game. 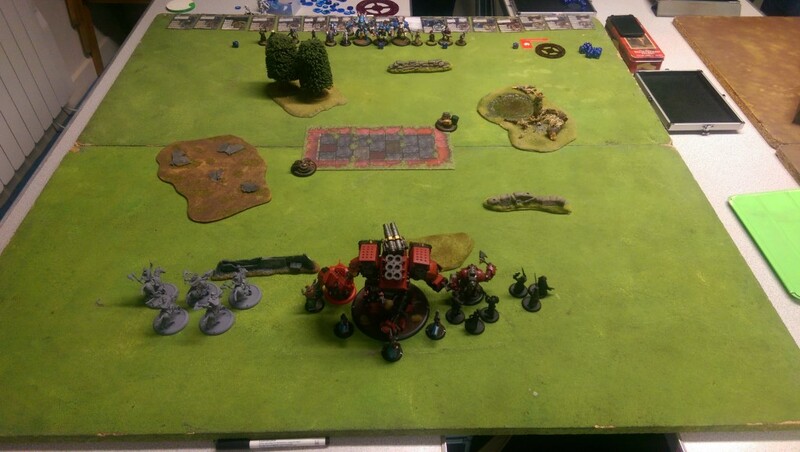 The picture above was prior to my Advance Moves on the Warjacks. Again we both advanced to the centre. I had Telgesh Mark on the Marauder, and the Koldun Lord powerboosted it to let it run forward. Rich shot 2 of the Outriders off the table, Dominated the Marauder and turned it around after an advance, letting the rest of his force take it apart easily. I advanced Zerkova and despite being tempted to put Telgesh Mark out again (Repudiate really stings! ), I opted to cast Occult Whispers and camp the rest. 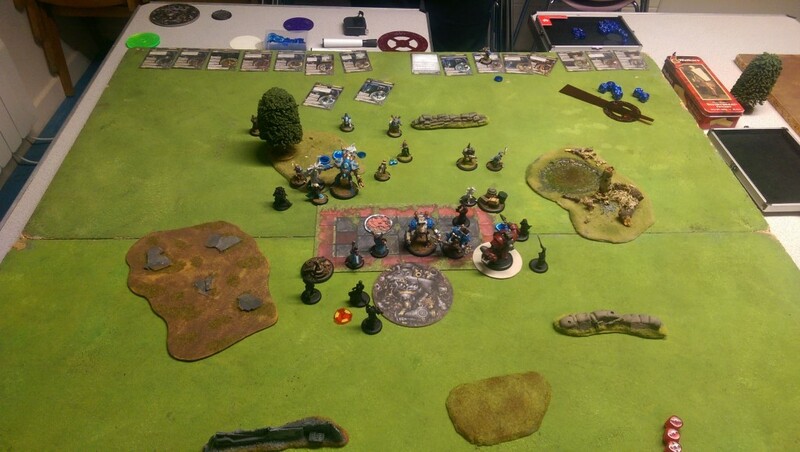 The Koldun advanced and Power Boosted Conquest, who went Crit-Dev fishing again, against the clump of ‘Jacks in the middle of the table – he successfully rolled a crit, but did not reach the magic number required for a successful hit 🙁 The greylords then advanced and started spraying at Haleys Granny and Prime, taking off a handful of damage from both. At this point, I was rolling fire for attack rolls and barely anything on the majority of the damage rolls. Once again, a concerted effort from Rich demolished the Conquest and forced me into an assassination attempt as I had no board control and attrition was slipping away from me fast (it was also approaching the end of the evening and we had to pack up soon). 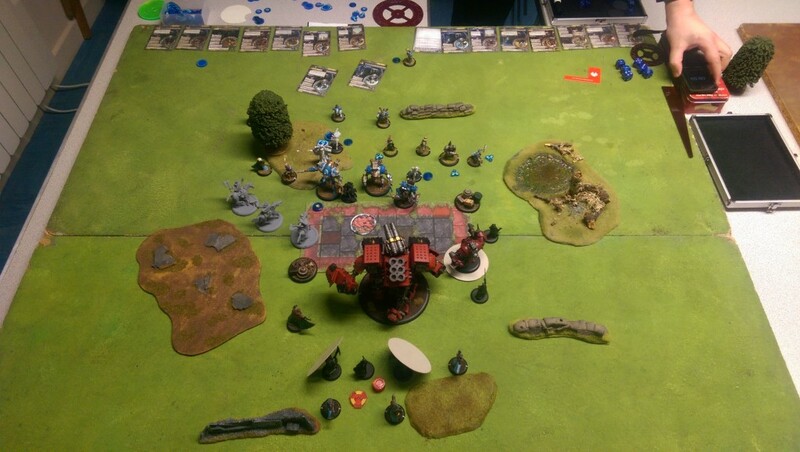 I ran up the Koldun Lord and Greylord Ternion to be in position to get attacks on Haley Prime, Zerkova activated, advanced and cast Occult Whispers and Telgesh Mark on the Koldun Lord, and then feated. Valachev Zephyr’ed Aiyana and Holt closer (in case Holt needed to finish the job), Aiyana attempted to put Kiss on Baby Haley – missing. 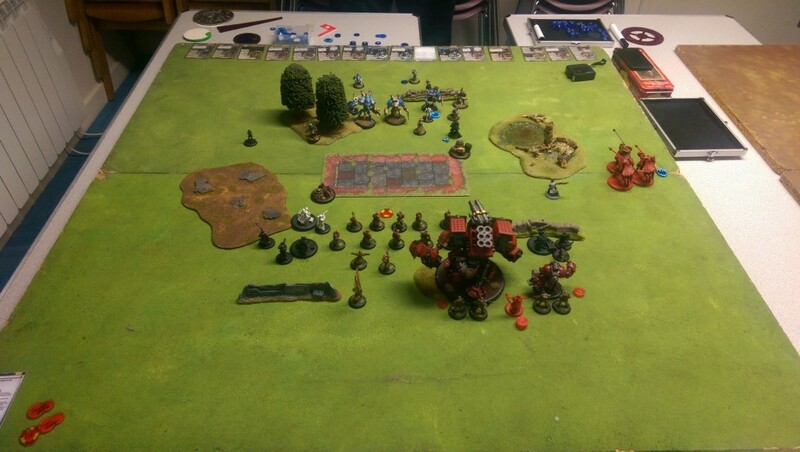 Zerkova attempted a Hoarfrost on Haley Prime, via the Koldun Lord, and missed after boosted the attack roll (miss on 4d6!). With no chance of the crit effect to make her stationary, I now had the Koldun Lord try to Ice Cage, and miss… The remaining Greylords tried spraying to no real effect, getting picked off by Harlan Versh’s Witch Hunter as they went. Again, I conceded following the failed assassination – time was up and we needed to pack up, but despite that, I had nothing to protect Zerkova from the following turn and the counter assassination was all but certain. The Haleys are a unit, and getting Kiss of Lyliss on one affects them all. I missed this opportunity as I wasn’t thinking of them as a unit, and Baby Haley was happily in range of Lady Aiyana, despite the action I was concentrating on was on the other side of the table, when I got the Outriders to spray over the other two Haleys. I need to learn to use the Ternion more aggressively – my main experience of them thus far has been to help shield Butcher 3 with the clouds, and that way of thinking/playing is hard to shake. Zerkova 2 makes them much more potent, and I need to capitalise on this. That said, having Aiyana and Holt Stealth with clouds on them, makes for a very safe Valachev if he can stand behind the clouds, out of their effect. When flanking Outriders, it is a fine line between having them safely off to the side, and also with in range to give threat from attack. I got this fine line wrong on this occasion. I think I much prefer the Zerkova 2 – Haley 3 match up, and it certainly has a lot more room to play than the Sorscha 2 list. If I wasn’t constraining myself to play in Theme for SmogCon, I would be a lot happier, but it was still a fun game that didn’t feel un-winnable.